Momedy Sketch: The 1/2 Report:..
First off thank you SO much for all the messages of support and encouragement. And to the awesome person who gave us that amazing home-coming. Reveal thyself. I want to give you a hug-and some chocolate. You rock. Totally made our day. Thank you!! is its unpredictable nature. For better and for worse. So. While we have been training for this the last couple of months, Benj has really kept up well with me, but he was usually a few steps behind, with me keeping the pace. I assumed the role of running-doula because although he was always very stoic, I could tell that from time to time he was getting a bit worn out. This was no problem for me. With the Galloway method I have found training to be pretty easy . Always manageable. Never actually hard. Sometimes I would get a bit bored and really ready to be finished and in a hot bath, but never...I. Am. Done before I was. It was just never a big deal. Today was shall we say-an "off" day. (I just love being a girl. Ya know? Say no more). In addition to these challenges, I had a hard time sleeping last night and up at the crack of dawn, but that was expected and I actually did not feel too bad this morning at all. And then we started running and my body was.."oh no...what's going on? I no likey!". We started at the back of the crowd and Benj was somewhat anxious when we remained in that vicinity. There were people behind us, sure, but I don't think there were very many. I was perfectly comfortable with this. 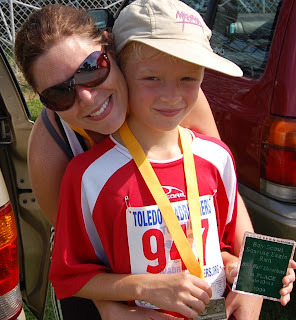 I truly had the goal to have a nice leisurely run with my son, one we'd find enjoyable and finish and that was it. I had no major issues with coming last. We were running 13 miles. Good enough. After a mile or two I hit my stride and things were humming along well enough. I kept telling him to quit looking behind us to check that there were still people there, and just focus on our race. He would say, "oh yay look 6 miles already...but mom I don't see anyone behind us". I would say, "we're at 6 miles, and that is absolutely all that counts". And so on. I kept waiting for the fatigue to kick in enough for him not to care about the competition. I forgot who he was. At about mile 9, I started feeling not good. I was surprised. I didn't have access to the time since my watch had been timing our run/walk breaks,but from what my rudimentary maths skills could cobble together, I guessed we were making really, really bad time . (Considering my only stipulation was that we come through the gate before 3 hours and only because that was when they packed up the food- this is saying a lot). So I was surprised that I was not feeling great. Benj however was super chipper. He chatted brightly the entire race, pointing out houses and estimating the income of the inhabitants thereof. (Let's just say the kid is easily impressed). For once, I was not the instigator of the conversation, trying to figure out interesting and distracting topics. I was merely the responder. The responder dodging road kill and trying not to pass out from the myriad of "country" smells. Neither which seemed to bother him a bit. At about mile 10 I (in non-doula mode) mentioned that I was feeling really tired. With my time calculations, I was starting to wonder if there was anyone left manning any of the remaining water stations. 'Cos mama needed her Gatorade, man. 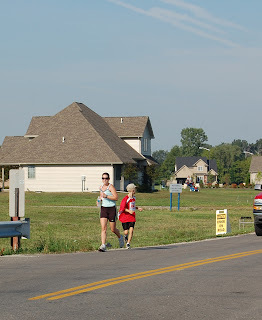 As we crested what I never ever would have considered a hill (before I ran on it after 10 miles), I saw the water station our church was manning. Lots of enthusiastic little cub scouts and friends. Nice. And then my heart sank. Nathan was running towards us, all fresh and sprightly and 5 minute mile-ish was Nathan. Nathan does not understand people who are not built to run at any sort of speed. (Like me). He mocks them (me) openly and derisively. And I was in no mood. 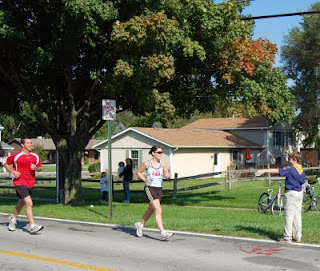 In fairness, Nathan was not actually just there to point and laugh, he had jumped into the race to support- to push us to the end (and burn off some of his excess energy). I knew this would be the death of me. I told him that he would need to physically push me the last 3 miles. Literally. As in- I wanted a piggy-back. I feared that Nathan's harassment was going to be the death of us. He was not going to be understanding of the all-important walking breaks. I knew this. This was so not good. He was going to kill us both! But he was actually rather kind and encouraging, and told us that we were still in the race and not in fact totally bringing up the rear. I thought that was nice of him to say but I did not believe him. Benj was delighted. 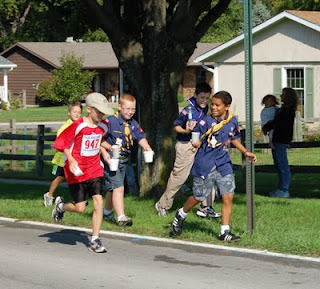 The little boost in morale- seeing his friends and family propelled him instantly yards ahead of me. Hey now, this was new. I cheered him on. ( Confident that I would catch up with him in no time when his little sugar/friend buzz wore off. Until he disappeared from view. Almost immediately. Benj was ON, man. He appeared to be having the time of his life. Me, not so much. In any of our training runs, by this point, with 5kms to go, I would be ready to open up and get speedy (relatively), and Benj would be asking if me if we really really had to run home when we got to the end of the trail. Now I was strolling along, resigned to my 3+ hour finish, just happy that my kid was cruising and not destined to shuffle in last beside his haggard mother after all. With Benj safely and happily dispatched, I lost all my remaining drive. If a stranger had come by offering a ride I would have probably hopped in happily and gone off to witness my kids' big finish. The only thing that kept me jogging along (with regular strolling intervals) was the fact that I wanted to get to the food sooner rather then later. 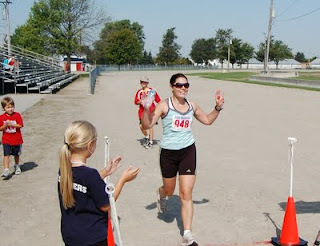 I have run a few 1/2 marathons and I well knew that being done with them is always the best part. I was looking forward to that. So there I was staggering along and actually starting to put on a little burst of speed, when I came upon a wee lad, puking his guts out. Seriously, this kid was kotching like there was no tomorrow. It was like the exorcist pea soup scene, only with water and red gatorade. It was coming out of every orifice of his face, so violent was the puking thereof. Somewhat disturbing. Poor kid. I chilled with him for a while, waiting for lulls in the puking to ask him how he was doing. Um, not good. So anyway, I'm now about a mile and a half from the end. This motivates me not. at. all. It was so odd. Once the end is in "sight" I can usually rally very well. Regardless of how tired I am. But not today. No desire. Nothing. And here comes Nathan again. Geez. He has run Benjamin to the end and come back for me. A gracious gesture. And at the time. I am fairly ungrateful about this. I had been quite happy to lurch forward at my own snail-like pace, with regular walking breaks for what I am sure is now my 4 hour finish and now Mr. Happy-Hyper was here telling me to get the lead out. He reports that Benj has finished in a blaze of glory, sprinting through the chute. He is impressed. I am thrilled. Still, ahead of us is several yards and then the longest most hateful dusty track I have ever seen (which I still have to navigate before reaching my bagel). My first thought is that my younger three kids (aged 9,7,5) have effortlessly raced that very 1/2 mile track that very morning. If they can, I can...right? Nathan resorts to making religious analogies about enduring to the end. I resort to wondering about when this d*mn thing will end. Nathan self righteously tells me to use the energy that I am using for swearing (d*mn is not a swear word!) for running instead. Tells me that it will end in 5 minutes if I persist in shuffling and 2 if I run. I deign to run. Benj comes sprinting out to meet me and runs the last 1/4 mile with me (effortlessly adding a 1/2 mile to the 13 miles he just did). 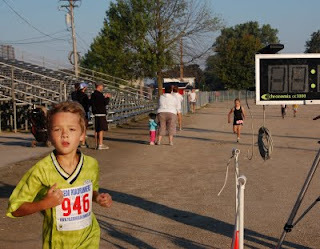 He tells me that he came first place in his age division. I finish 11:47 minutes after him. I was surprised to see that my time was 2:36: 47. Accounting for my Somewhat Good Samaritan activities, me and my apathy probably would have made it about 2:30. Yeah...but it's better then 4 hours anyway. Benj finished in 2:25. Accounting for hanging out with his slow mom he probably could have made it in a lot sooner. But he claims to have enjoyed hanging with his slow old mom and for that I love him. Gabe came 2nd in the 1/2 mile-second only to a child twice his height. His time was 3:33 mins. Gracie and Finny didn't stop to walk that endless track even once and made it in at 5:00mins. (Even though Gracie played a long hard soccer match last night,) All of them finished with a smile and reported it to have been easy and fun. Benj wants to find a race to run on Monday (yes, the day after tomorrow). I may have created a monster. Thanks for reading this marathon post (pun totally intended of course). I'm reading: The 1/2 Report:..Tweet this! You amaze me. You really do. YAY YOU and YAY BENJ. So what if mother nature threw a kink in your plans. YOU DID IT. Good job! Been waiting all day for your race report. You did awesome, especially considering how off you felt the entire race. Benj is too funny wanting to race on Monday! Tell him to rest a couple more days before his next one, k? But, you finished! You have motivated me to train and try for it next summer (I was thinking abouy doing the 1/2 this summer, but life got in the way, you know...) Way to go, girl! This is SO AWESOME!! I admire you for this more than you know! What an incredible experience. I would love to do something like this someday. Way to get your kids involved...I'm impressed. I totally see what you mean in those last pictures. 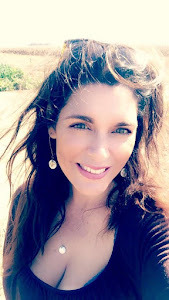 I have to say, you all are so amazing~the only way I'm traveling 13k is in a car! We are not athletes. At all. No one, on any side of any of our extended families, has ever done anything athletic to our knowledge (unless you count my sister playing coach pitch baseball when she was 7). We have artists, designers, singers, musicians, and crafters but ask us to walk around the block? Eh. Congrats to you all on a very successful (and fun) day! That was awesome Kirsty! So sorry that mother nature was so unkind. Total inspiration though! Glad you made it and had smiles on your faces after it was all said and done! Did you get your bagel?? Well done! I give you a standing ovation (ovation = ovaries) for running 2.5 hours while you had other physical issues to deal with. You. Are. Awesome. I hope that little boy who was sick is okay...Where the heck were his folks???? Okay. You've officially scared me, lady! I'm currently training for one of these things and I'm starting to get freaked out. I can't afford an "off" day because I don't think I have the strength to continue if I'm feeling pouty and quitter-like. 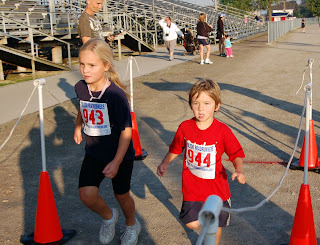 I am soooo amazed that your 11 year old just ran a half marathon!!! I am 100% positive that my 11 year old step son couldn't hack two full miles with me, let alone a half. I think I will test this out and make him run with me this week. :0 You've inspired me, and Benj CERTAINLY has! :) Great job finishing, and that time is wonderful. Be proud! 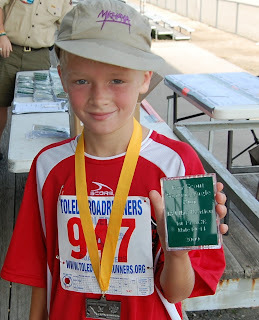 Congratulations to Benj on 1st place in his age group--how excellent! 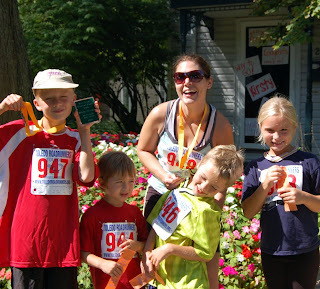 Congrats to your other kids on running great races that morning too! And Kirsty, congratulations on finishing what you started, even making a fairly respectable (before-they-packed-up-the-food) time though you felt much less than your best. Also, it was so kind of you to help that poor kid who was sick. I really admire you. I keep thinking that one of these days I'll follow your lead and try running, despite how intimidated I am by it. You're my hero--REALLY! Oh, Wow! What an incredible story Kirsty! I'm sorry you had such an "off" day, but I'm bursting for Benj! What a great experience for him. I am so impressed he could do it, not to mention his astounding finish time! It does appear a running monster has been created....but what a great one to create! Congrats on all your dedication and hard work, both of you! Oh man, Kirsty...I am so proud of you, as I can tell youm, that I. WOULD. DIE. WTG Benj....what a HUGE achievement!!! You must be glowing with pride! Rest your po' muscles today...have some chocolate...relax...you've earned it! Well done guys ! Good job by all of you - Nathan included. I will be using you for motivation when I run my relatively short and easy 10km in two weeks time ! I'm so proud of you!!! I am so happy that you were able to push through (even while not motivated) and finish. And with Auntie Flo visiting. What a trooper! And Benj...amazing. Way to go to both of you! Way to Go! I am so inspired! I can't believe how good you looked after, I totally would have needed a medic! I am SOO impressed, and proud of you guys!!! 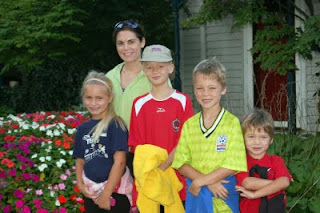 :):) I just love my family! :) D*mn Chicka! 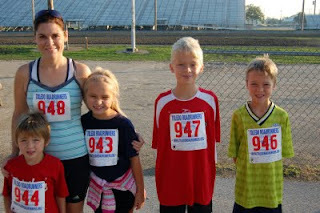 A momma of 17, I mean 4, and still running half marathons! :) Truly impressive.You have also inspired me... maybe I will start shuffling again. Am interested to read up more about the method that you used. My knee still gives me quite a bit of trouble :/ OK, hope to chat to you soon! Love you lots and lots and lots. Hooray!! I am so happy for you guys. What an amazing experience for little Benj and you. This was a great post. I only hope that someday we can do one of these together. Love you! !